A brief timeline of moments that shaped our company. In 1947 while in the hospital for his battle wounds, Ettinger discovered that research in the area of cryogenics was being done by French biologist Jean Rostand; Ettinger wrote a short story elucidating the concept of human cryopreservation as a pathway to more sophisticated future medical technology: in effect, a form of one-way medical time travel. The story, "The Penultimate Trump," was published in the March 1948 issue of Startling Stories and definitively establishes Ettinger's priority as the first person to have promulgated the cryonics paradigm, principally that contemporary medical/legal definitions of death are relative, not absolute, and are critically dependent upon the sophistication of available medical technology. Thus, a person apparently dead of a heart attack in a tribal village in the Amazon will soon become unequivocally so, whereas the same person with the same condition in the emergency department of large, industrialized city's hospital, might well be resuscitated and continue a long and healthy life. Ettinger observed that criteria for death will vary not just from place to place, but from time to time, and so today's corpse could be tomorrow's patient. Ettinger waited expectantly for prominent scientists or physicians to come to the same conclusion he had, and to take a position of public advocacy. By 1960, Ettinger finally made the scientific case for the idea, which had always been in the back of his mind. Ettinger was 42 years old and said he was increasingly aware of his own mortality. In what has been characterized as an historically important mid-life crisis, Ettinger summarized the idea of cryonics in a few pages, with the emphasis on life insurance, and sent this to approximately 200 people whom he selected from Who's Who in America. The response was very small, and it was clear that a much longer exposition was needed — mostly to counter cultural bias. Ettinger correctly saw that people, even the intellectually, financially and socially distinguished, would have to be educated into understanding his belief that dying is usually gradual and could be a reversible process, and that freezing damage is so limited (even though fatal by present criteria) that its reversibility demands relatively little in future progress. Ettinger soon made an even more troubling discovery, principally that "a great many people have to be coaxed into admitting that life is better than death, healthy is better than sick, smart is better than stupid, and immortality might be worth the trouble!" In 1962, Ettinger privately published a preliminary version of The Prospect of Immortality, in which he said that future technological advances could be used to bring people back to life. This finally attracted attention of a major publisher, which sent a copy to Isaac Asimov; Asimov said that the science behind cryonics was sound, and the manuscript was approved for a 1964 Doubleday hardcover and various subsequent editions which launched cryonics. The book became a selection of the Book of the Month Club and was published in nine languages. Ettinger became an "overnight" media celebrity, discussed in The New York Times, Time, Newsweek, Paris Match, Der Spiegel, Christian Century, and dozens of other periodicals. He appeared on television with David Frost, Johnny Carson, Steve Allen, and others. Ettinger also spoke on radio programs coast-to-coast to promote the idea of human cryopreservation. Since the commercial publication of The Prospect of Immortality, all those active in cryonics today can trace their involvement, directly or indirectly, to the publication of one or both of Ettinger's books. Ettinger was the first, most articulate, and most scientifically credible person to argue the idea of cryonics, therefore he has been credited with the founding of today's cryonics movement. 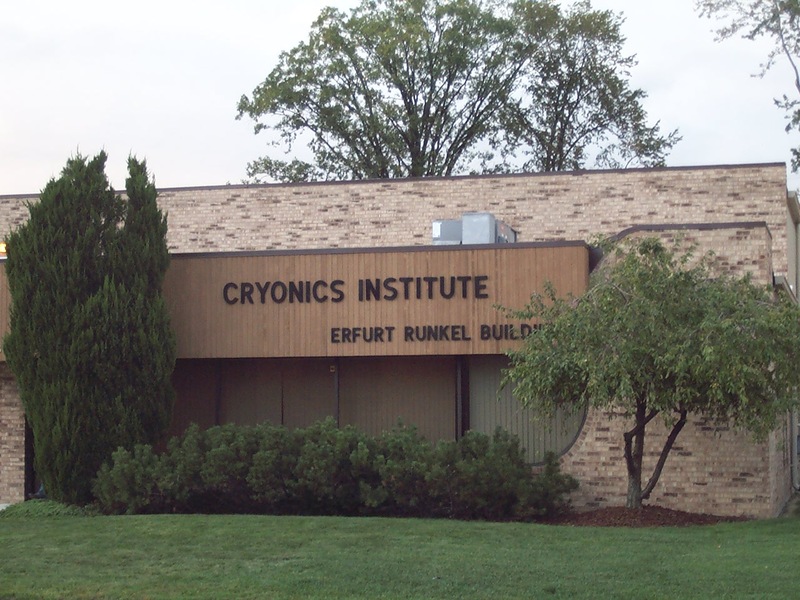 Then in 1976 a separate organization was formed: the Cryonics Institute, to offer cryostasis services: careful preparation, cooling, and long term patient care in liquid nitrogen. Does that lower fee mean lower quality patient care or services? No. The major part of other organizations' fees are earmarked for investment provisions totally unrelated to patient care and preparation. Methods and research differ, but overall we believe our procedures and policies give a better chance for patient survival than any other organization's — and this web site will show you the detailed reasons why. See for yourself. Read our FAQ and see a special section — clear and easy to read — called Comparing Procedures And Policies. It explains where your money goes, and why it goes to giving you and those you love the best possible chance for future survival. Remember: most CI members can afford the higher prices of other organizations for themselves and their families — and often do give more, in bequests and donations. But we've chosen CI — because we know it's our best bet. And yours. We have a unique, proven track record of financial security and stability. Price stability too. CI is the only organization with no debt, no stockholders, and no landlords. We own our patient care facilities outright, and all our officers and directors donate their services voluntarily. We're one of the oldest cryonics organizations in existence -- and the only such organization that has never raised its prices, even in high-inflation times like the late 70s and early 80s. Adjusting for inflation, our prices have actually steadily declined, and we expect this to continue. Financially, we are the soundest cryonics organization in existence. We have a uniquely flexible and rapid system of emergency patient care based on universally available networks of mortuary assistance (and often medical assistance). This means that in the critical early stages, we can bring qualified professionals to you faster than any other system — to you, and to travelers, vacationers, and members throughout most of the world. In particular, London-based F.A. Albin & Sons funeral directors are trained, practiced, equipped, and prepared to fly a team anywhere in Europe on short notice to help European CI members or tourists and business travellers. And lastly, we offer you a continually updated information center -- this web page. The site you're reading will lead you to everything you need to know about the subject of cryonics, and more. It offers you free information, free books, the latest news, hundreds of links to thousands of sources covering health, science, cutting-edge medicine, nanotechnology, financial help and resources, and supportive people and organizations. And if that's not enough? We personally will answer any question you might have about cryonics or the Cryonics Institute directly by email, or direct you to someone who can. In the world of cryonics, this is the source to visit, and the place to be. Researchers Greg Fahy and William F. Rall helped introduce vitrification to reproductive cryopreservation in the mid-1980s. As of 2000, researchers claim vitrification provides the benefits of cryopreservation without damage due to ice crystal formation. 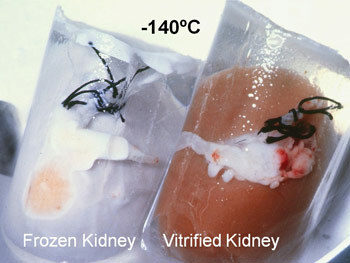 For clinical cryopreservation, vitrification usually requires the addition of cryoprotectants prior to cooling. The cryoprotectants act like antifreeze: they decrease the freezing temperature. They also increase the viscosity. Instead of crystallizing, the syrupy solution becomes an amorphous ice—- i.e., it vitrifies. Rather than a phase change from liquid to solid by crystallization, the amorphous state is like a "solid liquid", and the transformation is over a small temperature range described as the "glass transition" temperature. Vitrification of water is promoted by rapid cooling, and can be achieved without cryoprotectants by an extremely rapid decrease of temperature (megakelvins per second). The rate that is required to attain glassy state in pure water was considered to be impossible until 2005. Two conditions usually required to allow vitrification are an increase of the viscosity and a decrease of the freezing temperature. Many solutes do both, but larger molecules generally have larger effect, particularly on viscosity. Rapid cooling also promotes vitrification. The Cryonics Institute (CI) has been using a mixture for vitrification of the brains of cryopreserved pets and humans since August 2004, when it first did an experimental perfusion of the dog of a CI Member. The vitrification mixture goes by the name CI−VM−1 (CI Vitrification Mixture one) and was developed by CI Staff Cryobiologist Yuri Pichugin, PhD. The first published use of the vitrification mixture was in February 2005 with the vitrification of the dog Thor. The first human use was in August 2005 with the the vitrification of the 69th CI Patient. In August 2006 the Cryonics Institute filed a preliminary patent application for CI−VM−1 in anticipation of filing a complete patent application. Although a patent application was prepared, legal counsel advised that the chances of getting a patent were very slim because of commercial use more than one year prior to filing the preliminary patent application. We were advised to publish the CI vitrification and carrier solutions as a defensive measure so that others would not be able to prevent CI from using them. About 6.3 kilograms cryoprotectant divided by 9 kilograms total gives about 70% (w/w). The carrier solution is composed of 28 mM/L potassium chloride, 230 mM/L glucose and 10 mM/L organic TRIS − HCl buffer. One liter of 9 times (9X) concentrated carrier solution is made with 19 grams of KCl (potassium chloride), 372 grams of glucose and 11 grams of Tris [2-Amino-2-(hydroxymethyl)aminomethane] in 72 milliliters of 1.0 Normal HCl (hydrochloric acid) filtered in a 2 micron filter. VM-1 is not filtered. Dr. Pichugin believes that the combination of his vitrification solution and carrier solution are well optimized for both low viscosity and minimal expense, while providing powerful vitrification capability. He does not believe in the value of high molecular mass agents such as proteins, dextrans, HES, PVP, etc, to support oncotic pressure in brain perfusion in CI's protocol because he believes these agents increase viscosity and are not necessary due to the dehydrating effect of cryoprotectants. In practice the Cryonics Institute has not seen much brain edema or the need for oncotic support in perfusions of brains with CI−VM−1 and m−RPS−2. Dr. Pichugin has observed that carrier solution additives such as Ca2+, Mg2+, phosphate ion and inorganic buffers result in additive precipitation in CI−VM−1 plus carrier at low temperature -- which can block blood vessels during perfusion. For this reason these agents are not included in his carrier solution. Dr. Pichugin has assessed the ice blockers (Supercool X-1000 and Supercool Z-1000) from 21st Century Medicine to determine the possible benefit of adding these agents to CI−VM−1. Dr. Pichugin first determined that in cooling to −130ºC (and rewarming) at 0.3ºC/minute that the minimal (critical) concentration of CI−VM−1 required to vitrify (prevent ice formation) without ice blockers is 55% (52% CI−VM−1 without ice blockers results in ice crystals). Dr. Pichugin then determined that in cooling to −130ºC (and rewarming) at 0.3ºC/minute that the minimal (critical) concentration of CI−VM−1 required to vitrify (prevent ice formation) with ice blockers is 52% (50% CI−VM−1 with ice blockers results in ice crystals). If by using ice blockers a lesser amount of CI−VM−1 can be used to achieve an equivalent vitrification, then the result would be increased viability due to the reduced cryoprotectant toxicity associated with the reduced cryoprotectant concentration. Unlike cryoprotectants, ice blockers are not believed to be toxic. To test the toxic effects of CI−VM−1 (with or without ice blockers) hippocampal slices were saturated with increasing concentrations of ethylene glycol at 0ºC and −7ºC before cooling to −20ºC for ten minutes of saturation with CI−VM−1 (with or without ice blockers). The DMSO in CI−VM−1 is less toxic at lower temperatures, and is least toxic when introduced at −20ºC. Adding the ethylene glycol first and cooling at 0.3ºC/minute ensured that the solution would not be frozen at −20ºC when the CI−VM−1 (with or without ice blockers) is introduced. Toxicity assay was made using potassium/sodium ratios. Full viability (no toxicity) would be 100%. Note again that this is not a test of the ability of CI-VM-1 (with or without ice blockers) to prevent freezing. Dr. Pichugin does not believe that these increments of increased viability with ice blockers justify the increase in viscosity or cost if they were added to the CI−VM−1 formula, especially in light of the fact that ice blockers cannot cross cell membranes or the blood-brain barrier. If brain areas are very poorly perfused, then even ice blockers won't help. If the viscosity of ice blockers reduces perfusion, that reduces the benefit of ice blockers. Freezing within cells is not such a great problem because there are few nucleators inside cells. But there may be as many nucleators the interstitial fluid (between cells) as in the bloodstream. Therefore, the fact that ice blockers do not cross the blood-brain barrier may mean that the proposed benefit for poorly perfused areas is not so great. 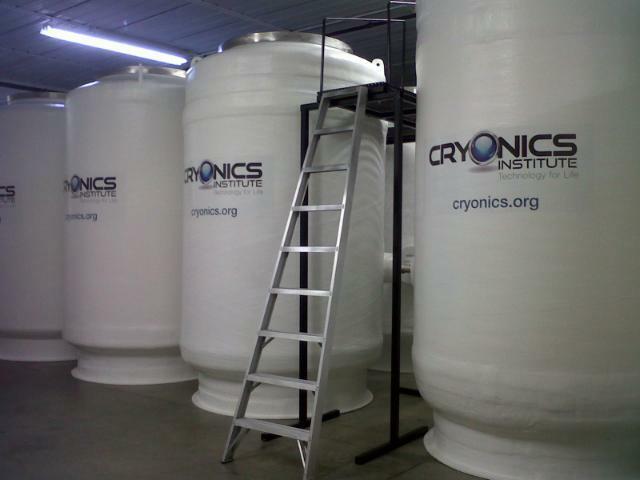 The Cryonics Institute uses industrial grade cryoprotectants, which helps keep the cost very low. But, although industrial grade, the cryoprotectants are still of high purity. The major impurity is water, which may be unsuitable for laboratories needing chemicals uncontaminated with water, but CI adds water to its cryoprotectant mixtures, anyway, so water as a "contaminant" is not a matter of concern. The DMSO is 99.7% pure with the only impurities listed being water, "color" and titratable acid (0.001 milliequivalents/gram). The ethylene glycol is 99.94% pure with the major impurity again being water: nearly 0.06%. The next largest impurities in the ethylene glycol are acetic acid (<0.001%) and ash (0.0005%). There are part-per-million amounts of chloride, "color", diethylene glycol, and iron in the ethylene glycol. The Cryonics Institute is the worlds leading non profit cryonics organization bringing state of the art cryogenic suspensions to the public at the most affordable prices. 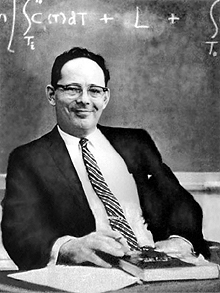 CI was founded by the father of cryonics Robert C Ettinger in 1976 as a means to preserve life at liquid nitrogen temperatures. As the future unveils newer and more sophisticated medical nanotechnology it is hoped that some day people preserved by CI may be restored to youth and health. We are dedicated to educating the public about cryonics and its mission to extend life.